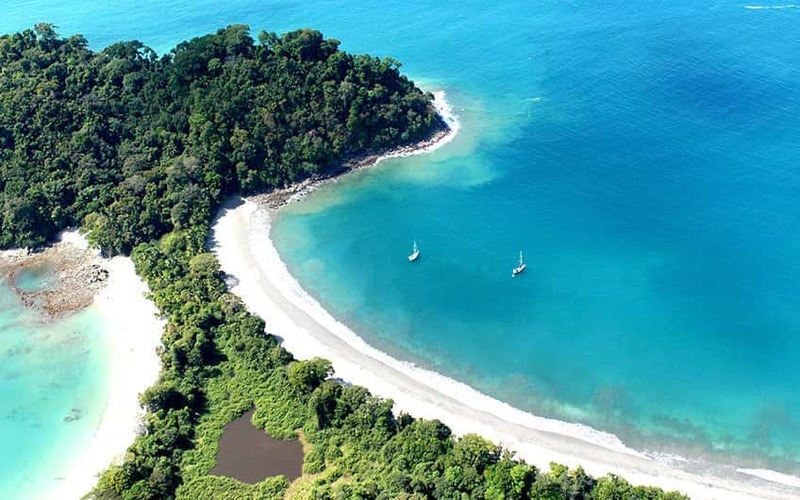 Manuel Antonio National Park is a biological reserve and touristy town in our country with primary forest, secondary forest, mangroves and beach vegetation. Also you can see species such as raccoons, coatis, two-toed sloths, white-faced monkeys, cats of considerable size and marmoset, among other species. To celebrate its 40 years of existence, the Ministry of Environment, in conjunction with the National System of Conservation Areas (SINAC), invited 40 ambassadors from different countries, who walked the path to Punta Catedral, where they observed species as howler monkeys, sloths, white-faced monkeys and raccoons. The Manuel Antonio National Park Costa Rica is home of the white faced capuchin, mantled howler and red-backed squirrel monkeys, two and three toad sloths, among other mammals, as well as a number of species of birds. Punta Catedral (cathedral point), the bay of Puerto Escondido (hidden port), and the beautiful beaches with blue green waters represent some of the main attractions of this park. This National Park is famous worldwide for its beauty and it included in the itinerary of many visitors to the country. We invite you to visit this place when you visit Costa Rica.